By selecting the ‘Mekong River Basin’ from the left panel where it says 2River Basins in Focus’, detailed information will appear about the area. 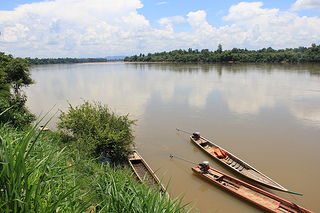 The Mekong River is the longest river in Southeast Asia and the tenth longest river in the world. It begins its journey in China’s Tibetan Plateau; fed by snow melt from the Tibetan Himalayas, the Mekong drops down through Myanmar, Lao PDR, Thailand, Cambodia and Vietnam before emptying into the South China Sea in southern Vietnam. Although the Mekong River Basin is one of the richest areas of biodiversity in the world, the region’s governments are determined on constructing scores of dams on the Mekong mainstream and its branches. This threatens to irreversibly impact its multitude of ecosystems as well as the livelihoods and food sovereignty of millions of people.